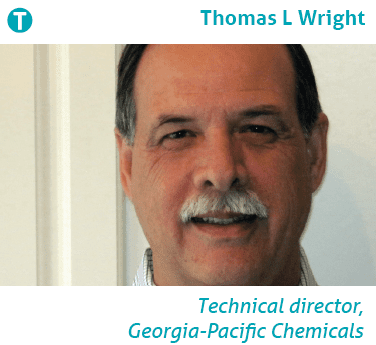 Thomas L. Wright, technical director, Georgia-Pacific Chemicals, explains how the NAVIGATOR coating programme is designed to operate in today’s demanding environment of high temperatures and low reel moisture. A TWM report. The Yankee Dryer reflects the sum total of all the profile and moisture variables of a paper machine. This makes the Yankee Dryer coating package the last opportunity to achieve targeted sheet specifications for the finished product. It is at the core of determining the endpoint of sheet characteristics and machine production uptime. Along with sheet quality, protection of the expensive dryer is an essential consideration of the Yankee Dryer coating formulation. Standard coating packages have been unable to effectively meet two recent trends in tissue making. First, the introduction of recycled fibre has required better protection for the Yankee Dryer itself. Secondly, the evolution toward low moisture environments for tissue creping grades has limited the ability of standard coating packages to create a durable, pliable, and cohesive coating that maintains sheet control, manages adhesion and prevents chatter. In addition, the pursuit of improved quality in terms of stretch, bulk and softness has driven dryer surface temperatures up, in particular those of the dryer edges, increasing them as much as 100°F. Traditional Yankee Dryer coating chemistries have struggled to perform in this new environment of higher temperatures in the creping process. In response, coating deficiencies have required that machine parameters be pushed in an attempt to improve the chemistries’ performance. The new NAVIGATOR® coating technology from Georgia-Pacific Chemicals, however, allows the paper machine to operate at its peak performance without being limited by Yankee coating constraints. Leveraging its understanding of, and expertise in, the molecular level of paper chemicals and their molecular interaction with paper, Georgia-Pacific Chemicals scientists invested ten years of concentrated research developing NAVIGATOR Yankee Dryer products. They are uniquely formulated to operate in today’s demanding environment of high temperatures and low reel moisture while producing quality products with maximum throughput. The NAVIGATOR coating programme is tailored for each individual machine’s specific operational environment and quality specifications. Figure 2 is the roadmap utilised by the scientists at Georgia-Pacific Chemicals to connect the molecular changes required to formulate those specific features for Yankee Dryer protection and sheet control. The first step taken to formulate products customised for an individual machine is a machine audit. This audit reveals the influencing chemical, furnish, mechanical and temperature parameters that will need to be managed by the coating chemistry. Manufacture of the coatings is based on this analysis to produce the molecular structures best suited for the machine’s particular needs and environments. The resulting NAVIGATOR coating and release products perform under a wide range of sheet moistures, operating temperatures and grade targets, and are effective on both standard and structured sheet machines. 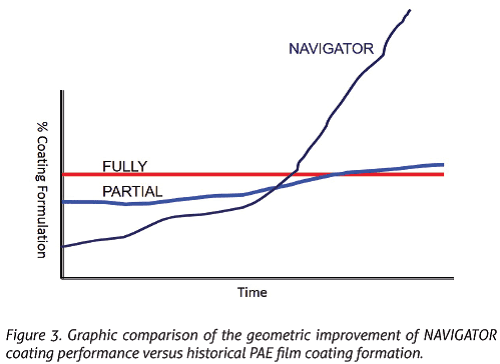 The NAVIGATOR reactive formulations form coatings exponentially improved beyond the traditional fully and partially crosslinked polyamideamine-epichlorohydrin (PAE) structures. The specific benefits that have been seen in actual manufacturing conditions indicate the NAVIGATOR products represent a real breakthrough for the industry, particularly for premium grade sheet production machines. The ever increasing demand on Yankee Dryer programmes to perform at higher temperature ranges as well as the demand for low moisture creping with its reduction in bonding sites in the coating matrix, challenge the ability of coatings to maintain cohesive force and adhere sheet edges. NAVIGATOR Yankee coating programmes can form a coating film that captures the available moisture to maintain the correct film softness and coating wet tack needed. 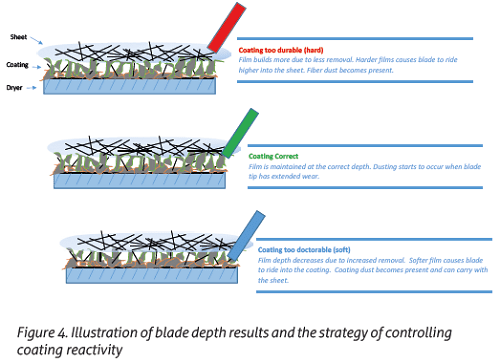 The tailored NAVIGATOR coating regulates creping blade depth and, coupled with durable cohesive forces on the sheet, maintains sheet edge controls. 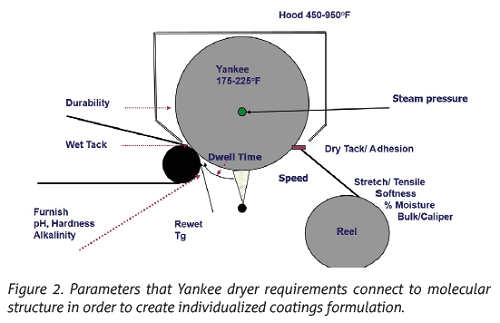 As a result, the coating keeps the dryer edges from hardening so chatter does not form on the Yankee Dryer surface. The machine-specific natures of the NAVIGATOR coating products create a greater depth of film that protects the Yankee dryer and allows the creping blade to ride through the coating at the optimum depth. 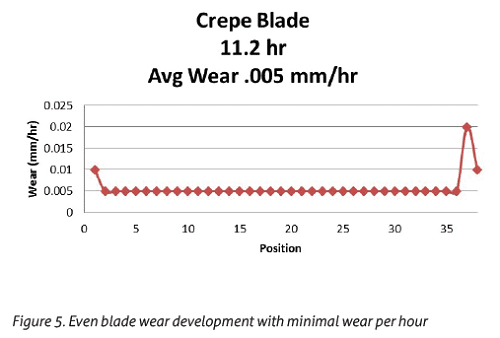 Benefits include higher production, improved blade wear as well as the ability to increase crepe ratio and sheet softness. In conjunction with NAVIGATOR coating formulations, Georgia-Pacific Chemicals has developed a new range of release agents and modifiers to control coating development rates. These products also work with reactive PAE formulations to extend blade life and develop an even Cross Direction (CD) blade wear on the dryer. A line of NAVIGATOR softeners and debonders designed to meet the specifications for sheet softness, bulk and absorbency is also available. A towel manufacturer realised a 16% increase in output by applying NAVIGATOR Yankee Dryer chemicals without making any other adjustments to its operation. This product trial demonstrated improved edge control, positive dry crepe improvement and exceptional sheet transfer at the pressure roll. Sheet softness and bulk were improved to achieve their targeted specifications. To compete effectively, tissue and towel manufacturers require the flexibility to meet changing demands for softness, strength, higher crepe or other market-desired attributes. To maximise that flexibility to move quickly, the depth of understanding of an individual paper machine can result in meeting those demands easily. The proven, tailored NAVIGATOR programme provides manufacturers with that understanding and success. Share the post "Chemical technology breakthrough targets significant Yankee Dryer performance improvement"